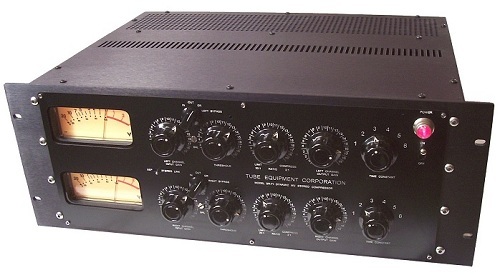 In the late 1950’s and early 60’s, Fairchild Recording Equipment Corporation produced a legendary recording and mastering compressor known as the model 660 and the stereo model 670. From Abbey Road to Sunset Boulevard, the Fairchild was a crucial ingredient in many popular recordings. Although Altec, Gates and Teletronics also made compressors which used the same 6386 variable-mu tube or similar variant, most employed a more meager gain control sidechain afterward, based on a simple high-impedance tube diode circuit to obtain the varying DC control voltage used to dynamically change the gain of these “Remote-Cutoff” tubes. This was easier and required fewer parts than Fairchild’s approach, but had the disadvantage of lacking sufficient attack time to grab the fastest transients. The high impedance tube diode lacked the current to charge the timing capacitors fast enough and this delayed the onset of gain reduction. Disk cutting and radio needed faster response time to avoid trouble. 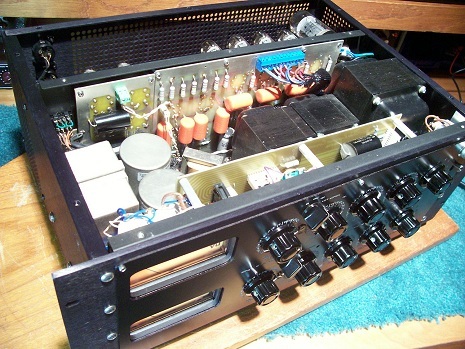 Faced with this design requirement for faster transient control, Fairchild designer Rein Narma chose to employ as a sidechain amp, a fairly substantial Push-Pull audio power amplifier and diode bridge rectifier to create the 80 or so volts needed to fully control the grids of the remote-cutoff tubes, and do it quickly. This amp allowed for a lot of instantly available current to rapidly charge the timing capacitors which basically look like a near dead-short until charged. The result was attack time on the order of half a millisecond. A pair of them, however, made the 670 an utter beast in size. Tube Equipment Corporation SR-71 next to our custom tube curve tracer/analyzer, AES 2011. This bombastic but effective solution to attack time was great for keeping disk cutter heads from disintegrating, and sparing radio stations from a nasty FCC Overmodulation Notice, and soon Fairchild had orders for their faster compressors. Although originally targeted to mastering and broadcasting, they soon found their way into the studio control room. Ultimately, they became an indispensable recording tool for many, and a very identifiable sound on popular records of the 60’s and onward. Modern-day releases using the Fairchild continue to stand out for the splendid and highly musical artifacts which the 660 and 670 seem to impart on anything that passes through them. 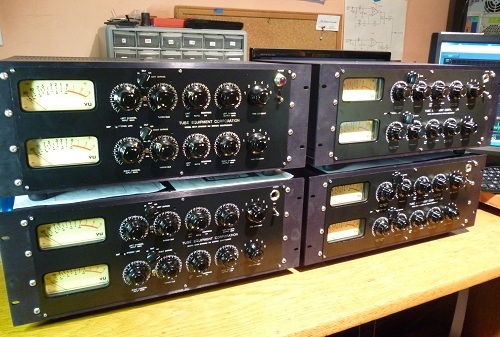 Tube Equipment Corporation SR-71 x 4, Dynamic Mu Stereo Vacuum Tube Compressors ready for shipment. 8-Channels of SR-71! Twin 15-watt, push-pull tube audio amplifiers in the sidechain added about 40 pounds to 670, when compared to more sparse designs of the day, and 15 watts is but a small IC today, yet 50 years later, many still say there is no substitute for that 670 sound. In addition, if the vintage market is any evidence, a Fairchild 660 or 670 will fetch far more than the Gates, Altec and UREI compressors of that era. We believe this is not just Ebay madness..that there really is something unique to the 670 sound compared to other compressors. Something worth trying to achieve in a modern unit for well under $30,000. Perhaps with tubes and other parts that one would still be likely to find in 10 or 20 years. Several current Remote-Cutoff (6386-type) tube compressors on the market today use the above mentioned high impedance tube diode circuit as a signal rectifier in the sidechain. Others use solid state sidechain amplifiers. Neither seem to sound exactly like a push-pull tube amp driving 4 diodes to us. That’s just our opinion. We wish this were not the case. This is a lot of extra work! Tube Equipment Corporation - Transformer Analyzer GUI - Updated Prototype. Tube Equipment Corporation is now able to quantify our trademark sound highly associated with our products transformer characteristics. We have chosen to use the original Fairchild 670 basic circuit, with the exception of employing a more plentiful pair of 6BQ5/EL-84s instead of 6973s as sidechain output tubes, a 6L6 as a high voltage regulator, and a far more available quartet of 6BA6s per channel as vari-mu tubes in lieu of the scarce or prohibitively expensive 6386s. We also use a big power transistor to control the DC filament voltage of the 8 6BA6s. The plate curves of the 6BA6s wired as triodes are virtually identical to the plate curves of the original 6386s when viewed on a tube curve tracer. In addition to the above, several release times (1,2,3) have been shortened, for more flexibility with percussive material. 2 is the new 1. The complexity and loss of gain made us choose not to implement the “Lateral-Vertical” matrix. 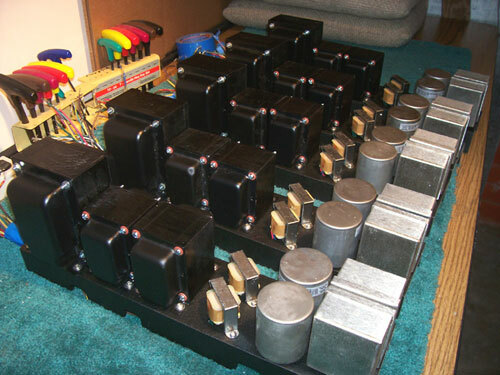 Sowter Transformers are used in the audio path. They are Mumetal shielded and isolated from the chassis for superior hum rejection. Their use results in a flatter frequency response than the original 670 transformers in the region between 10kHz and 20kHz. This allows more usefulness in mastering and mix bus applications. 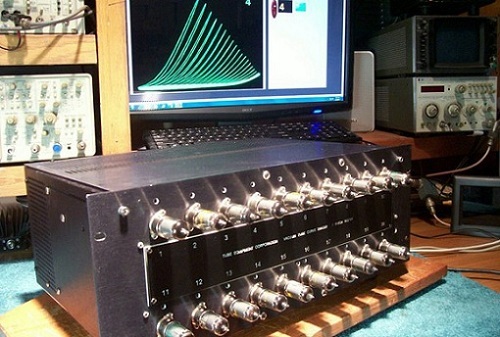 An original 660 or 670 is typically several dB down by 20kHz. At 44 lbs. it’s a very substantial piece of equipment, and very true to the original circuit in virtually all aspects. And, it’s only 4 Rack Units tall! 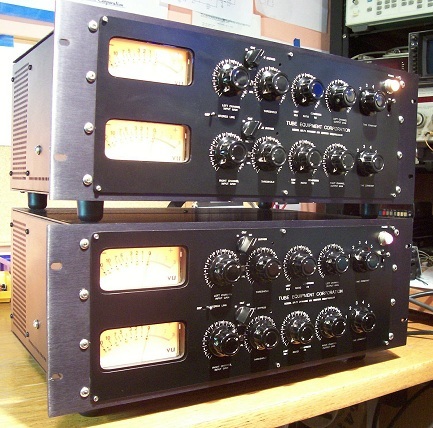 Tube Equipment Corporation SR-71 x 2, Dynamic Mu Stereo Vacuum Tube Compressors ready for shipment. What a fine-looking couple. Tube Equipment Corporation SR-71, Dynamic Mu Stereo Vacuum Tube Compressor. Tube Equipment Corporation SR-71, Dynamic Mu Stereo Vacuum Tube Compressor, inside view. Tube Equipment Corporation SR-71, Dynamic Mu Stereo Vacuum Tube Compressor transformer trusses, mounted with an array of Sowter and Hammond transformers, ready for installation. Tube Equipment Corporation prototype Batch Vacuum Tube Curve Tracer and analysis system. Hardware and software are shown matching the plate curves of 6BA6 tubes to our reference data files. 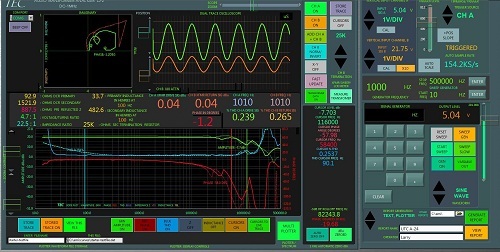 Tube Equipment Corporation, prototype, Batch Vacuum Tube Curve Tracer and analysis system graphical user interface. Looks like we have a match! 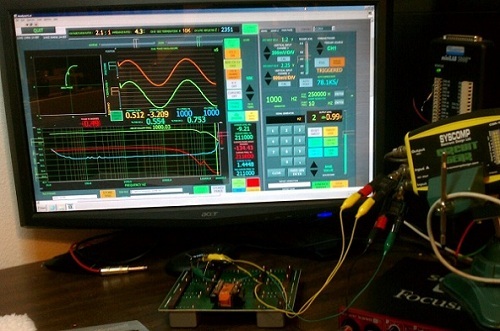 Tube Equipment Corporation, Transformer Analyzation System, Prototype. The system is plotting the characteristics of a TAM-203 transformer (600 ohm-10K ohm), from 10Hz - 250 KHz with 10k of termination on the secondary. The green trace is frequency, red trace is phase angle, and blue trace is THD. Quantification of the question "What does it sound like?" is an absolute necessity. Do you have content, to add, about Tube Equipment Corporation SR-71 Compressor/Limiter or associated topics? Please feel free to Share it, here!